Joan Miller, centre, is pictured with her award, along with Coun Liz Simpson and Coun Scott Dickinson. A dedicated community champion has been presented with an award to honour her efforts. Joan Miller, from Hadston, has been named as a Northumberland Local Hero. 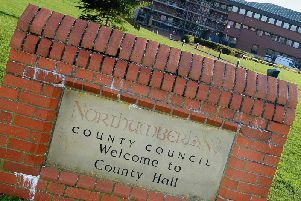 The county-wide scheme, run by Northumberland County Council, highlights how much good work is done by local people for the benefit of neighbours and their local area. Joan was nominated by the area’s county and parish councillor Scott Dickinson. He said: “Joan is a well-known community person who has worked tirelessly in our community for years. She has served the area with the Poppy Appeal for more than 25 years and organised the Shoe Box Appeal, sending thousands of Christmas boxes to disadvantaged children all over the world, with help from locals. Joan, centre, is pictured with her award, along with Coun Liz Simpson and Coun Dickinson.